During October London continued to be the principle target for the long range bombers, being raided every night. However with the planned invasion of Britain now shelved the Luftwaffe High Command ordered more bombing effort to be put into night harassing attacks on the harbour installations at Bristol, Liverpool and Glasgow, with the industrial centres of Birmingham and Coventry as alternative targets, while still maintaining the pressure on the capital. As a result I Fliegerkorps was transferred to Luftflotte 3 adding to its inventory the He 111's of KG 1 and KG 26 as well as the Ju 88's of KG 76 and KG 77, although, a number of these units were to remain non-operational for some time. In spite of a non stop assault, by early November it had become obvious that the Luftwaffe's attempt at battering London to produce a British surrender was not proving at all successful, as the bombing was too scattered over the great area of the metropolis to produce any large scale destruction, or collapse of civilian morale. Consequently the attacks were now to be directed more against Britain's manufacturing base, combined with a concentrated assault on the ports as part of the policy of blockade, which was also integrated with an all out submarine war at sea. With regard to the switch to the manufacturing base, the necessary instructions were issued on November 8th ordering preparations to be made for attacks on Coventry, Birmingham, and Wolverhampton, which were to be lead by the X-Verfahren equipped He 111's of KGr 100. The first attack of the series, that against Coventry, took place on the night of November 14th, and was carried out by 449 long-range bombers. On November 21st the Luftwaffe High Command issued targeting instructions ordering Luftflotte 3 to attack the larger harbours in their operational area, starting with a raid on Southampton on the night of the 23rd. During these operations the Germans considered that any lack of training in night navigation and bomb aiming would be more than compensated by the employment of their radio bombing beams. The premature use over England from June onwards had, however, compromised the secrecy of Knickebein, the only system available to the whole bomber force, and enabled the British to build jammers to counter it. These were to prove very successful and the Luftwaffe was soon deprived of a simple and efficient bombing aid. Sadly for the inhabitants of many British cities efforts were much less effective against X-Verfahren, and the Germans' latest development Y-Verfahren, which was about to make its operational debut over the area. Y-Verfahren employed a highly complex single directional radio beam to provide track guidance to the target, while associated with this was a range measuring facility. Since it required only one ground transmitting station, and left minimum latitude for human error, Y-Verfahren was technically the most advanced of the German systems. The one serious disadvantage, however, was that unlike Knickebein and X-Verfahren, only one aircraft at a time could use the system because of the communications and other signals involved, and consequently an interval of five to ten minutes usually separated each attacking aircraft. The two specialist units, KGr 100 equipped with X-Verfahren, and III/KG 26 operating Y-Verfahen, became collectively known as Beleuchtergruppen or 'Firelighters' serving as pathfinders for the main bomber force. Their aircraft were employed to start fires during the early stages of an attack, which helped to guide the normal bomber units to the target area. They were assisted by a third unit II/KG 55, which although not officially recognised as a Beleuchtergruppe, had considerable operational experience and had displayed particular skill at finding targets at night. It was this unit, employing standard navigational techniques, that dropped parachute marker flares and very high calibre bombs at the commencement of major attacks on the West Country during the winter of 1940/41. The H.E. 's carried externally on their aircraft were used not only to created fires, but also in an attempt to damage the water mains in the target area and so hamper the fire-fighters activities. In Bristol these 1800, 1700 and 1400 kg weapons were often mistaken for Land Mines, few of which were in fact ever deployed against the city. Because of the weak British defences concentration of effort in time and place was not considered necessary, and so the attacking aircraft operated singly over the target, at about four minute intervals. The various Gruppen involved were also ordered to attack at widely spaced times, to cause the maximum disruption, not only to the area actually under attack, but also to the country as a whole, by placing much of it under a 'Red Alert'. As a result the attacks could last from dusk to dawn, although on occasion poor weather on the Continent necessitated operations to cease before midnight. The orders for the night of November 24th were for the first major attack on Bruder, the German code name for Bristol, but as there had been a good deal of fog over Northern France earlier in the day, and a chance that it might return, it was decided operations should be completed by midnight. A total of 148 aircraft were ordered to the city, 135 of which claimed to have attacked between 18.30 and 23.00 hrs with 156.25 tonnes of H.E. 's, 4.75 tonnes of Oil Bombs and 12,500 I.B.'s. The Concentration Point was centered on the harbour and industrial plant on both sides of the City Docks, with the intention of "eliminating Bristol as an importing port supplying much of the Midlands and South of England". The aircraft involved in this operation were drawn from I/KG 1, III/KG 26, LG 1, I and III/KG 27, KGr 100, KGr 606, I, II, and III/KG 51, Stab, I, II, and III/KG 55. Late in the afternoon the RAF's Radio Monitoring Service reported that there were slight indications that 'X-Beams' were aligned over Bristol, but KGr 100 subsequently claimed to have bombed only by Dead Reckoning and Knickebein. III/KG 26, however, attacked using Y-Verfahren, and the Cherbourg transmitter was monitored on 45.7 mc/s. In addition the Cherbourg and Dieppe Knickebein stations laid beams over the city during the evening. The wind in the target area was moderate to gentle WSW, and parachute flares were successfully dropped by II/KG 55 at the commencement of the raid. Initially, however, because of broken high cloud bombing was undertaken mostly by radio and Dead Reckoning methods, but as the attack progressed the sky cleared and it became possible to bomb visually, guided by the fires which could be seen from some 250 kilometeres. In general the line of run-up to the target was from south to north, but later in the evening large cumulus clouds developed over the city, as a result of numerous fires, and some raiders were tracked flying round Bristol and approaching from the north. At about 19.13 hrs the small gasholder at Marksbury Road, Bedminster had exploded and the high jet of flame this produced was noted by both KGr 100 and II/KG 55, although the latter assumed it to be a gasometer at target GB 52 52, the St.Philip's Gasworks. The general impression given by participating airmen was that results were similar to those achieved at Birmingham and Coventry. As a distributing centre and important railway junction Bristol, it was announced, had been wiped out. "Of all the ports on the West Coast, Bristol WAS the nearest and best situated for the Midlands, London and the South Coast". For the Germans it had been a very successful night and only 2 aircraft failed to return, as a result of which 4 crewmen were killed and a further 4 made prisoner, including one who was injured. However, the attack, which commenced at 18.21 hrs, resulted in the death of 200 Bristolians and injuries to a further 689. It became concentrated on the central area, with further damage occurring in Clifton, Temple, Knowle, Barton Hill and Eastville, but greatest destruction took place in the heart of the City from Broad Quay to Old Market, while St.James' Barton and St.Philip's suffered severely. Exceedingly large calibre bombs were reported as having fallen at Eastville, Speedwell, Temple and Totterdown, while for the greater part of the night the City was blazing furiously and many well known buildings were totally destroyed and others gravely damaged. For the greater part of the night the central shopping area was blazing furiously, and across Bristol some 307 incidents were logged before the 'All Clear' sounded just after midnight. The AFS got off to a very good start and within 30 minutes of the warning some 897 part-time personnel had reported for duty, seven of whom subsequently lost their lives. 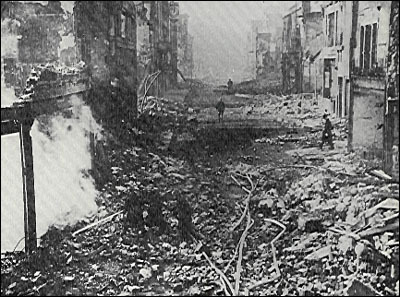 In total 194 calls of fire were received, and as this completely overwhelmed the 224 available pumping appliances, at 19.38 hrs reinforcements were requested under the Regional Reinforcement Scheme, resulting in some 81 brigades being sent into the city from Gloucestershire, Somerset, Wiltshire, Hampshire, Dorset, Oxfordshire, Berkshire, Buckinghamshire, Surrey, London, Kent and South Wales, while 20,000 feet of hose was also obtained from Cardiff, Newport, Bournemouth and Plymouth. To compound the misery at 23.10 hrs the main water supply failed completely owing to damaged trunk mains and water subsequently had to be obtained from the Floating Harbour, River Frome, and other supplementary supplies through direct and relay pumping. Operations continued throughout the night and although shortly after daybreak the fires had been brought under control 26 were still smoldering and being attended to some 36 hours later. ARP Wardens and Fire Watchers, both men and women, also battled with the 12,500 incendiaries dropped by the raiders, but the attack resulted in the death of a Fire Watcher, as well as 19 men, 3 women and 2 messengers from the Warden's Service. Many people were also trapped in wrecked buildings and Rescue Parties were called to 86 occurrences from which 137 persons were subsequently rescued alive and 107 bodies recovered. In spite of the falling bombs the medical, hospital and nursing staffs and those in charge of first-aid posts still managed to render speedy and efficient aid to the 187 severe casualties and the 703 who reported slightly injured, but lost two ambulance drivers in the process. Mercifully, the casualties, though heavy, were far below the number anticipated, and this was largely due to the centre of the city being less frequented on a Sunday than on business days. Nevertheless, large scale disruption was caused to peoples lives and in the following 12 days the voluntary workers at the hostels served some 70,294 meals to those deprived of cooking facilities or rendered homeless. One of the most difficult situations of the night occurred near Redcliff Hill, where numbers 16 to 18 Bryant Street were completely demolished by a high explosive bomb which also caused a fire. Here, the residents of adjoining houses were being evacuated when cries were heard coming from beneath the burning debris. Herbert Stanford, a Group Warden, immediately took charge of the situation and, while a fire pump was still playing water on the blaze, he worked his way through to the victims on his stomach and was soon able to give them a little water, along with much needed words of encouragement. As it was found impossible to get the trapped people out alive by removing the debris on top, it was decided to make a hole in the wall which divided the shattered building from the next house. Unfortunately, however, when this had been done the rescuers were still unable to get through as there was an obstruction by debris inside. A temporary hold-up ensued, but Stanford was not to be beaten and decided a way could be cleared by knocking out a fire grate. This was an awkward task and it was three hours before it was possible to rescue a little boy alive and uninjured, followed half an hour later by a slightly older girl. The remainder of the six shelterers, however, were pinned down by debris and a doctor had to be lowered to give injections to one woman who was held down by a heavy load of earth on her legs. During the hours it took to free them the building was still burning, coal gas was escaping and the raid was still going on above. As a result of his outstanding bravery, initiative and perseverance and having set such a fine example, on February 28th 1941, Herbert Stanford was awarded the George Medal and his portrait was painted for the Nation's War Records. Although the attack force had lost two aircraft none of these were accounted for by Bristol's heavy anti-aircraft guns which fired a total of 3404 rounds, or by locally based fighters, although a Hurricane of No.87 Squadron inconclusively engaged an He 111 illuminated in a searchlight over the city. During the attack balloons in the Bristol barrage fared badly with some 15 either being set adrift or brought down with damage caused by bomb splinters, while one operator was also killed by a high explosive bomb which scored a direct hit on a balloon site. A total of 337 suspect devices were subsequently reported and, after inspection by personnel from the City Engineer's Department and sappers loaned from the Royal Engineers, 175 unexploded bombs were left to be delt with by the recently re-trained No.853 (Quarrying) Company RE which was to be responsible for bomb disposal in the Bristol area for the next few months! 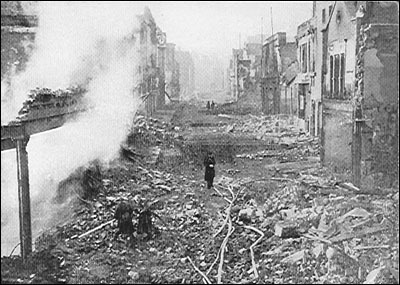 This raid, engraved on the minds of Bristolians who lived through it for the amount of damage caused, at last highlighted the complete inability of the local air defence system to protect the city from Luftwaffe bombers, and this was not helped by the fact that the 'Starfish' decoy sites had not been fired as the expert responsible could not be found. Nevertheless, the following night, during a small scale raid on Avonmouth, the first 'Starfish' operation in Britain took place when the Chew Magna decoy was successfully lit, but unfortunately it failed to attract any bombs. Extensive fog on the Continent ruled out any more large scale raids for the next few days, but with good weather still prevailing at Vannes airfield, an X-Verfahren assisted attack was mounted by KGr 100 against the docks at Avonmouth on the night of November 25th. Nine aircraft participated, but with thick cloud over the target area only one serious incident resulted, this being a fire at the Shell Canning Factory at the Royal Edward Dock. The next night, with fog still widespread on the Continent KGr 100 returned to Avonmouth with 7 aircraft, all operating with X-Verfahren, again against targets in the Royal Edward Dock. On this occasion there was thick cloud at 1200 metres with only occasional clear intervals, and no significant damage was caused, the majority of the bombs falling harmlessly on open ground in the Avonmouth and Shirehampton areas. Plymouth, London, Liverpool and Southampton were attacked next, while Bristol was the target for a second major raid on the night of December 2nd. However, once again the operation was restricted to the first half of the night to allow the participating aircraft drawn from 1 and III/KG 1, II/KG 77, II and III/LG 1, 1 and III/KG 27, KGr 100, KGr 606, I and II/KG 54, KGr 806, 1 and II/KG 55 to return to base before the onset of widespread fog on the Continent. The attack, which the Germans claimed was to complete the work of destroying the industrial and port installations at Bristol, was carried out by 121 aircraft between 18.20 and 22.30 hrs, with 120.9 tonnes of H.E. 's, a tonne of Oil Bombs and 22,140 I.B.'s. Prior to the raid the RAF had correctly identified 'X-Beams' laid over the city, and just before nightfall the Knickebein transmitter at Dieppe, previously deployed over London, suddenly swung round and to be re-aligned over Bristol. In the target area at the start of the raid there was nearly 10/10ths cloud cover in two layers, the lower lying between 300 and 1000 metres, and the upper between 2500 and 3000 metres. Underneath, surface visibility was bad and down to 1000 metres, with the result that initial bombing was by Knickebein and Dead Reckoning methods. The general line of approach by the raiders was from the south, though a few aircraft were tracked in from the north-west. Parachute flares and I.B. 's were dropped at the start of the raid by II/KG 55, but due to the exceptionally overcast conditions many initially fell over Clifton and the northern parts of the town. However, immediately after this opening attack Oberleutnant Otto-Bernard Harms, Staffelkäpitan of 4/KG 55, dived through both layers of cloud to an altitude of 300 metres to check on the positioning of the Gruppe's target marking fires. Despite the poor visibility he confirmed the accuracy which his Gruppe had achieved using Knickebein and Dead Reckoning, aided by the flares. This was undertaken with complete disregard to the Balloon Barrage and strong anti-aircraft defences. Later, isolated breaks occurred in the cloud cover enabling some visual bombing to be carried out, but the returning crews were unable to provide an accurate assessment of the success of the operation. Again the attack force's losses had been minimal and on this occasion amounted to just 4 men killed as the result of a single aircraft crashing on take-off. Unknown to the Germans the damage caused to Bristol was of a more widespread nature than on November 24th, but the main concentration was astride a line running about due east and west through Redfield, St.Paul's, Cotham and Redland. As result 156 people were killed and a further 270 injured. The total number of incidents reported between 18.16 and 04.00 hrs were 340, and although all Bristol's ARP Services became fully extended, it was not necessary to call in Region for outside reinforcements. Once again it was the Fire Services which bore the brunt of the attack and of the 197 reported fires, 6 were categorised serious and 76 medium, these being fought by a total of 409 pumps and 1518 firemen, of which two, both AFS men, lost their lives. For the second time Bristol's unfortunate firemen were completely overwhelmed and at 18.52 hrs reinforcements were requested, some 63 brigades from Gloucestershire, Somerset, Wiltshire, Devon, Dorset, Oxfordshire, Berkshire, Monmouthshire, Warwickshire, Worcestershire, Buckinghamshire, and South Wales subsequently despatching 94 pumps, 470 personnel and nearly 10,000 feet of additional hose to Bristol, ensuring that shortly before daybreak the fires were all under control. Rescue Parties were called to 66 occurrences from which they brought out 135 persons alive and recovered 117 bodies, the most serious incident being at Dean Street, St.Paul's, where a large calibre bomb had fallen. On arrival the Rescue Party found the street to be completely blocked by large heaps of debris, a very large crater, and the collapse of several three-storey Georgian houses, one of which housed a Warden's Post. Although 12 people were eventually rescued alive from the wreckage it was to take 27 days to remove the bodies of all 40 of those who had been killed, including 15 personnel of the Warden's Post. The bravery of Derrick Belfall, a young Messenger who was fatally injured while carrying a message from his post should never be forgotten. This lad, who was only 14 years old but had given his age as 16 to join the service, was on his way to the Central Police Station when he passed by a house from which flames were beginning to issue. Thrusting open the front door, he stumbled over a stirrup pump which he picked up and turned on the fire, soon bringing it under control. Relieved presently by the householder, he went on his way, but soon afterwards, hearing cries, rushed into another burning building and brought out from it an injured and badly frightened baby. He again continued on his way, but as he neared his destination he was struck by a bomb fragment and was found gravely wounded in Nelson Street. Before he died in the Bristol Royal Infirmary he murmured, "Messenger Belfall reporting. I have delivered my message." For the defences it was another unsuccessful night as poor weather prevented much fighter activity, and although Bristol's heavy guns fired 4556 rounds no enemy aircraft were destroyed. During the course of the raid a high explosive bomb fell some ten yards from a Lewis gun emplacement on the Purdown heavy gun site wounding seven men, two of whom were seriously injured, one fatally, the first death from enemy action suffered by Bristol's anti-aircraft gunners. On a more positive side, damage to the balloon barrage was considerably less than on November 24th and amounted to just four envelopes punctured by bomb splinters and two operators slightly injured, while Bristol's two decoys were also lit, Stockwood drawing 62 bombs and Chew Magna a further six. Raids on Birmingham and Plymouth followed, but on the night of December 6th Bristol's third large raid within a fortnight took place, some 67 crews claiming to have bombed the city with 77.5 tonnes of H.E. 's, half a tonne of Oil Bombs and 5688 I.B's, between 19.20 and 22.45 hrs. This was smaller scale effort than the previous two attacks on Bristol as gale force west to north-west winds on the Continent had restricted the activity of the bomber force, and once again the attack was compressed in time. The RAF Monitoring Service detected 'X-Beams' which came on during the afternoon, but these were switched off before the evening's activity commenced due to KGr 100 being forced to cancel operations. However, Knickebein transmissions monitored during the early evening gave the British authorities an indication that Bristol was the intended target. The attack force on this occasion comprised I and III/KG 77, I and II/LG 1, II/KG 27, I and II/KG 51, I, II and III/KG 55. As a result of the non-appearance of KGr 100 the raid undertaken without precision radio assisted pathfinders, and was opened by II/KG 55 dropping marker flares, a number of which were carried away to the east in the strong westerly wind. The direction from which the attack was made was quite different to that used in previous operations, the raiders following a line from Shaftesbury to Bath, and when east of Bristol turning due west to attack the city from east to west. In the target area the night was extremely cold, but fine and moonlit, with 1/10th cloud cover at about 750 metres. The good visibility with only a small amount of broken cloud therefore permitted visual bombing, and the operation was considered to have been carried out successfully. Once again losses were acceptable, and although no aircraft failed to return 3 crashed on the Continent, resulting in the death of 6 crewmen with a further 6 being injured. Sadly in Bristol it was a different story, and during the course of this attack 100 people were killed and 188 injured, with much damage being caused by fire. The areas mainly affected that night were in the vicinity of St.Philip's Marsh, Temple Meads, the city centre and Cotham, and Rescue Parties were sent to 34 occurrences from which 38 persons were rescued alive and 61 bodies recovered. In all 104 fires were started, of which 11 were minor, 43 small, 45 medium and 5 serious forcing the city to request reinforcements at 19.59 hrs, some 32 brigades subsequently arriving from Gloucestershire, Somerset, Wiltshire and Devon. The overall situation was, however, not as serious as in the previous two large scale attacks, and by 04.30 hrs all fires were under control, nevertheless, during the night three AFS men had lost their lives and another been detained in hospital suffering from severe lacerations. Although the Civil Defence Services lost only one member that night the unfortunate lady, Dorothy Cook of the WVS, lost her life after a week of continual duty when her Mobile Canteen crashed over the dockside, trapping her in the vehicle. On the defence side the night of December 6th saw the one and only 'Hampden Patrol' ever flown over Bristol, but once again no enemy aircraft were destroyed by the city's defences although the heavy guns fired a total of 1013 rounds and the Stockwood decoy drew 73 bombs. For a second time a high explosive bomb impacted on a local gun site, this time Brickfields, where it exploded under the concrete foundations. One gun, which had been firing a few moments before, was put out of action, but casualties were luckily restricted to only two men injured. Between December 8th 1940 and January 2nd 1941, London, Birmingham, Sheffield, Liverpool, Manchester and Cardiff all suffered at the hands of German bombers, whilst the new year saw the forces of Luftflotte 3 deployed against the West Country received a boost with the decision to employ the bomber units of Luftflotte 2 in joint operations over Bristol. Thus both II Fliegerkorps and the anti-shipping IX Fliegerkorps joined the attacks on the area, bringing with them the He 111's of KG 4, KG 28 and KG 53, the Ju 88's of KG 30, and the Do 17's of KG 2 and KG 3. In spite of this German operations during January were seriously hampered by the bitterly cold north easterly winds, freezing conditions and snow which covered much of Britain and the Continent. For Bristol the New Year started with a combined attack by 178 aircraft, their task being to complete the destruction of the harbour installations, large mills, warehouses and cold stores in the city, in order to paralyse it as a large trading centre supplying Southern England. During this raid, which took place on the night of January 3rd, the Germans claimed to have targeted Bristol with 152 tonnes of H.E's, 2 tonnes of Oil Bombs and 53,568 I.B. 's, the town centre on both sides of the River Avon being the concentration point. The aircraft from Luftflotte 3 were drawn from I and III/KG 1, I and III/KG 77, I and III/KG 26, I/LG 1, I and II/KG 27, KGr 100, I and II/KG 54, Stab, I, II and III/KG 55, while elements of KG 30, KG 4, KG 3, KG 2 and KG 53 operated under Luftflotte 2. Before the raid started RAF radio intercepts had indicated that an attack was to be mounted against Bristol. It was known that navigational beams were to be in operation from 17.00 hrs, with the first raid expected to reach Bristol at 18.30 hrs on a beam transmitted by the Cherbourg Knickebein on a bearing of 335 degrees. In addition X-Verfahren was operating, while II/KG 55 were as usual to drop parachute flares early in the operation. The attack was opened by Luftflotte 3 which operated 111 aircraft over Bristol between 18.35 and 00.38 hrs, with a second wave of 67 bombers from Luftflotte 2 attacking between 01.40 and 05.51 hrs. Many aircraft appeared to meander about after crossing the British Coast and some early arrivals circled the Bristol area before bombing. These were awaiting the arrival of the pathfinder aircraft from KGr 100 which were late departing Vannes because of weather conditions. III/KG 26 were even later arriving over the target and on this occasion bombed visually and not by means of their usual Y-Verfahren. It was a bitterly cold night with a clear starlit sky and at the start of the raid the City itself with a covering of snow and the course of the River Avon, were both clearly visible in the moonlight. The amount of cloud cover increased as the night progressed, but breaks still permitted a degree of visual bombing, although recourse to Knickebein and Dead Reckoning bombing was at times necessary until the fires had developed sufficiently to be used as aiming points. In spite of clouds closing over the target crews operating after midnight were able to observe the fires burning at Bristol from a distance of 150 to 170 kilometres. For the Germans it was another successful night with only one aircraft crash-landing on return, and no crewmen killed or injured. Once again Bristol suffered badly with casualty figures of 149 dead, and 351 injured. 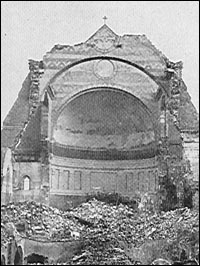 The principle areas affected that night were Bedminster, St.Philip's, Hotwells and Cotham, with both Temple Meads Station and the City Docks sustaining a certain amount of damage and had so many buildings in the centre of the city not been previously demolished, this would probably have proved more destructive than any of the previous raids. Some 150 incidents were subsequently plotted at ARP Control, but the actual number was greatly in excess of this number as, owing to a modification in routine as a result of the experience of former raids, minor incidents causing neither damage or casualties, were no longer reported. Although casualties were also less than on November 24th, nevertheless, in Bristol 149 people were killed and 315 injured. The night was one of the winters bitterest and the lot of the fire-fighters was perhaps the worst for as water streamed from their jets huge icicles formed on the buildings, while great sheets of ice on the roadways added to their misery. To assist Bristol 60 brigades were drafted in from Gloucestershire, Somerset, Devon, Hampshire, Oxfordshire, Berkshire, Buckinghamshire and Surrey, and although much property was saved the night saw eight local firemen, and two Fire Watchers, as well as a Police War Reserve Constable and an Ambulance Driver, loose their lives. All eight firemen and the Police Constable in fact died in High Street, where for some time the Fire Service had been fighting to save the Posada Restaurant. At first they seemed to be winning the battle, but towards midnight the bombers came over again. Nevertheless, despite the falling high explosive bombs four firemen and two soldiers continued to pour water onto the building which was well alight. It was then that a heavy bomb fell at the back of Oliver's shop opposite sending burning debris in all directions, and bringing down a number of nearby buildings. As a result, both Oliver's and the Posada were blown flat and the firemen on the roof were blown off, while those standing in the road were buried under tons of fallen masonry. Just before noon the following day rescue workers digging amid the ruins found the bodies of two Auxiliary Firemen and a soldier, but it took many more hours to shift the rest of the debris and recover the remaining bodies. The Rescue Parties were also busy elsewhere, the other major occurrence being in Berkeley Square where several days were spent recovering trapped persons and 15 bodies from the YWCA Hostel. During the night Fighter Command instituted 'Operation Layers' over Bristol for the first time, but in spite of such a large number of enemy aircraft operating the sole claim of a Junkers Ju 88 damaged at 21,000 feet over the city by a Hurricane of No.87 Squadron was as near as the fighters came to success. The heavy anti-aircraft guns fared no better and in spite of expending 1317 rounds no raiders were brought down. Local decoys were also fired and while the Chew Magna 'Starfish' collected six high explosives and about a thousand incendiaries the Stockwood site failed to attract any bombs at all. A follow-up attack by 103 aircraft was also attempted against Avonmouth on the night of January 4th, the concentration point being centred on the docks and industrial installations situated in the west and north west part of the town. The total bomb load dropped between 18.35 and 06.15 hrs was reported as 106.5 tonnes of H.E. 's, 1.5 tonnes of Oil Bombs and 27,722 I.B.'s. Participating units of Luftflotte 3 were II and III/KG 77, I/KG 26, I and II/KG 27, KGr 100, I, II and III/KG 51, I and II/KG 54, while from Luftflotte 2 came elements of KG 30, KG 4, KG 3, KG 2 and KG 53. The RAF Monitoring Service were unable to give any early warning of an impending attack on Bristol and it was not until 18.45 hrs that the Kleve Knickebein was detected having laid a beam over the Thames Estuary area. In addition KGr 100 were discovered operating with X-Verfahren. It was another very cold night, but the weather at the start of the attack was moderately good with 8/10ths cloud at 1500 metres and a bright moon, so the first formations arriving over the target were, in a number of cases, able to bomb visually. However, as the attack progressed thick cloud cover developed after which bombing was principally by Dead Reckoning and Knickebein, or by using the previously kindled fires as aiming points. The thick clouds made it difficult to assess the overall results, and only after midnight were light flickering fires reported in the Avonmouth Dock area. Again only one aircraft crash-landed on return and no crew casualties resulted. Unknown to the Germans, the raid had actually failed to develop at Avonmouth, and although a number of fires were caused in buildings of national importance, most had been extinguished by 22.00 hrs. The bombing had, by this time, dispersed along the Bristol Channel coast, past Clevedon where a soldier was killed and three people injured, to Weston super Mare where a sharp attack took place. In the Bristol area only two people were killed and five injured, but sadly at Weston 34 died and a further 85 received injuries as a result of the five H.E. 's and an estimated 3000 I.B. 's which fell on the town. In response to the raid the Bleadon decoy was activated, but as the ignition switches failed to operate an airman lit the dummy buildings by hand, immediately attracting the bombers which dropped hundreds of incendiaries and a number of high explosive bombs on the site. As a result of this courageous action, on March 7th 1941, AC2 Cecil Frederick Mason Bright was awarded a well deserved Military Medal. The Luftwaffe now switched their attention to Manchester, London, Portsmouth, Plymouth and Derby, but photographic reconnaissance eventually revealed that Avonmouth had been virtually undamaged by the January 4th raid, and so accordingly was singled out for another attack. This also fitted in well with new instructions issued on January 13th by the High Command of the German Armed Forces, which stated that the attacks still being carried out against the industrial cities of Britain were to be scaled down in favour of an all out night time assault on the most important importing harbours, the approaches to which were also being mined. However, key points of the air armaments and aircraft industry were still to be subjected, whenever possible, to Pirate attacks by single aircraft during daylight hours. The next large scale effort against Avonmouth, planned for the night of January 16th was to be centred on the town and northern half of the dock area and its industrial installations while, in addition, single aircraft were briefed to attack Parnall Aircraft at Yate and Gloster's at Brockworth. The raiders, all from Luftflotte 3, were drawn from III/KG 26, I/LG 1, I, II and III/KG 27, KGr 100, I, II and III/KG 51, I and II/KG 54, KGr 806, Stab, I, II and III/KG 55. That night a total of 126 aircraft reported over Avonmouth, and 15 over Bristol between 19.30 and 05.08 hrs, claiming to have dropped 158.2 tonnes of H.E. 's and 54,864 I.B.'s. Both X and Y-Verfahren were in operation although an 'X-Beam' signal failure and winds stronger than forecast made KGr 100's bombing uncertain. Flares were again dropped at the beginning of the attack, and also at 01.45 hrs when a second phase began. Early in the raid numerous I.B's were released over the dock area and a number of fires were started, but with the assistance of military personnel they were speedily extinguished, and damage to vital buildings was confined to small dimensions. A further shower of I.B's fell in the early hours of the 17th, but on this occasion the fires started quickly got out of control, and damage done to docks' property and industrial buildings in the area was considerable. Unknown to the Luftwaffe they had in fact succeeded in causing such serious damage at Avonmouth that January 17th was the only day during the entire war, that, due to enemy action, the Docks were prevented from working normally. Casualties were, however, mercifully smaller than in previous large scale attacks, with only 18 killed and 109 injured in the whole of the Bristol area. During the night an 'Operation Layers' was flown over Bristol by 12 Hurricanes from No.87 Squadron at Charmy Down and No.501 Squadron at Filton, but results were disappointing, and to add to the problems the absence of anti-aircraft gun fire while the fighters were patrolling over the city had caused widespread comment and discontent among Bristol's population. Nevertheless, during the night the local heavy guns had expended 2943 rounds, and 28 high explosive bombs which might otherwise have fallen on populated areas were attracted by the Chew Magna 'Starfish'. The Avonmouth balloon barrage, however, had a particularly bad night, a high explosive bomb scoring a direct hit on one of their sites causing the death of three balloon operators, and injuring seven others. During the third week of January extremely poor weather set in and locally there was little Luftwaffe activity for the next month, those missions which were flown concentrating on Swansea, Southampton and London. The unfavorable weather prevailed for much of February, with many of the grass airfields on the continent waterlogged, severely hampering Luftwaffe offensive operations. As a result, during February only two significant raids were carried out, both against Swansea. The situation did, however, permit a number of 'Pirate' raids on aircraft manufacturing plants to be undertaken by low flying aircraft taking advantage of the overcast conditions. 'Pirate' sorties became a regular feature of operations towards the end of the month, and on the 22nd an He 111 of II/KG 27 attempted a raid on the Parnall Aircraft factory at Yate. It successfully penetrated the defences as far as the Severn Estuary, but as it neared Avonmouth, in drizzle beneath the low scud, it was hit by AA gunfire and crashing on the mud at Portbury became the second victim of Bristol's heavy anti-aircraft guns. Early in the afternoon of February 22nd a single He 111 making for Parnall Aircraft at Yate was seen flying at 600 feet over the Portishead Power station. It was immediately engaged by the Gordano gun site which loosed off eight rounds, causing the raider to reduce altitude and strike a nearby barrage balloon cable before crashing on Portbury Wharf, the second, and last, enemy aircraft brought down by Bristol's heavy anti-aircraft guns during World War Two. II/KG 27, however, returned and on the afternoon of February 27th when a particularly successful raid was made on the Parnall plant, by a single He 111 commanded by Oberleutnant Hermann Lohmann. Weather conditions again favoured 'Pirate' operations with much low cloud and occasional rain and drizzle in the target area. The attack was carried out at 14.36 hrs, from a height of only 30 metres, with seven 250 kg H.E. 's some fitted with delayed action fuzes. Lohmann later reported that he had come in from the north, with the bombs being distributed over the whole length of the target. Five hits were observed on a workshop and an explosion was seen in the northern part of the target area. At Parnall's factory considerable damage had indeed been caused, and tragically 53 workers died, with a further 150 being injured, many of them victims of the delayed action bombs. The aircraft itself was lucky to escape for it had been successfully engaged by the Yate defences, with 8 rounds of 40mm Bofors, and 40 rounds of 0.303" from light machine guns, which knocked out the Heinkel's port engine. Nevertheless, the damaged aircraft eventually limped back to base and this was, in fact, the nearest that the local light guns ever came to bringing down an enemy aircraft during the course of the war. During March, as the weather improved and with the bomber units reinforced and partly re-equipped, it became possible to resume the offensive against the principle British ports, while in daylight the 'Pirate' attacks continued against aircraft factories and other associated industrial installations. On March 6th it was the turn of the Bristol Aeroplane Company to be targeted by a lone He 111 of I/KG 27 commanded by Oberleutnant Hollinde. The bomber's arrival caused the Bristol sirens to sound just after 18.00 hrs on that gloomy evening and after machine gunning the outskirts of the city seven H.E's were aimed at the Filton works. The weapons, however, missed the factory completely but it was assumed that serious damage had been caused, and for this achievement the crew were given special mention in the High Command of the Armed Forces communiqué issued the following day. By contrast the Yate plant of Parnall Aircraft was again successfully attacked by Oberleutnant Lohmann on the afternoon of March 7th, when he engaged the target with another seven 250 kg bombs from a height of just 25 metres! Lohmann reported that five bombs had made hits on assembly shops, with the other two falling on accommodation blocks and outbuildings in the southern part of the factory complex. For their actions during this, and for their previous attack on February 27th, this crew were also given a special mention in the High Command of the Armed Forces communiqué issued on March 9th. Happily for Parnall's employees, on this occasion only three workers were killed and 20 injured. However, as a result of the additional damage caused during the raid production came to a complete standstill and the total dispersal of the factory was immediately undertaken. Now, as the weather improved, it became possible to resume the battle with new offensive blows against Cardiff, London, Portsmouth, Birmingham, Liverpool, Glasgow, Hull and Sheffield, and by the middle of the month the German bomber force facing Britain had been reinforced and was back to the size it had been at the end of 1940. On the night of March 16th the harbour installations at Bristol and Avonmouth were again selected for attack, and 164 crews from the bomber units of Luftflotte 3 subsequently reported over the area, claiming to have dropped a total of 164.25 tonnes of H.E. 's and 33,840 I.B's between 20.35 and 03.25 hrs. To guide the pathfinders 'X-Beams' were aligned over Avonmouth and 'Y-Beams' over Bristol, while flares were also dropped at the commencement of the attack. At Avonmouth the Concentration Point was a rectangle covering the port area adjacent warehouses and industrial works, while at Bristol it was centred on the Floating Harbour, down stream of the Bathurst Basin. The attack force for the raid was drawn from I and II/KG 1, III/KG 26, I and II/KG 77, Stab, I, II and III/KG 55, I, II and III/KG 27, KGr 100, I, II and III/KG 51, I/KG 54 and II/KG 76. Over the target areas the German crews initially encountered thick cloud, with mist later, and consequently bombing was predominantly by Knickebein and Dead Reckoning. However, towards the close of the attack intermittent improvements in conditions enabled some crews to bomb visually, but many used searchlight activity as an indication that they were over the city, sometimes additionally aided by the glow of fires seen through cloud or mist. A large detonation followed by a tongue of flame some 1000 metres high was observed a little after midnight, and this the crews correctly assumed was the explosion of a gasometer, although they thought it to be at the St.Philip's Gas Works, rather than at its true location at Stapleton Road. German casualties on this night were higher than in previous attempts against the Bristol area, but none of the aircraft had been brought down by the defences. In all 5 crashed in France killing 12 men and injuring a further 6, while the one aircraft which did come down in England did so as a result of engine failure. This resulted in a further 4 crewmen being taken prisoner. During the raids bombs fell in many parts of Bristol, but the main attack was roughly east to west of a line from Stapleton Road Station, through the City Centre to Clifton Down Station. In addition to the City Centre, the areas most affected were Fishponds, Eastville, Whitehall, Easton, St.Paul's, Montpelier, Kingsdown, Cotham, Redland and Clifton. Of all Bristol's major air attacks this was perhaps the worst as due to the poor visibility over the target area the raid had drifted into mainly residential parts, a number of bombers being attracted by the few large fires which had developed. As a result the City's casualty figures were higher than at any time during the war, with 257 killed and 391 injured. However, unknown to the suffering Bristolians things in the area could have been a lot worse, for it had been intended that the bomber units of Luftflotte 2 should also participate in the attack, but fog over their bases in the Low Countries, had prevented them from operating. As the raid was of such a serious nature ARP reinforcements had to be moved into the city from Clevedon, Warmley, Gloucestershire, Somerset, Bath, and Wiltshire, while some 35 Fire Brigades from Gloucestershire, Somerset, Wiltshire, Dorset and Devon also came to assist Bristol. With such a high casualty figure, not surprisingly the Civil Defence and Police Services were badly mauled with some 40 personnel loosing their lives, 20 Fire Watchers, 6 Fire Guards, 4 Shelter Wardens, 3 ARP Wardens, 2 Rescue Service members, 2 War Reserve Constables, a Decontamination Party member, a Casualty Service Auxiliary Nurse and a Report & Control Service Liaison Officer. Shortly after the 'Alert' sounded a bomb partially demolished No.1 Alfred Place, Kingsdown, leaving it in a very dangerous state, with gas escaping from a fractured pipe. Frank Braund, his wife Lilian, their three children Jean, Shirley and Valery, as well as Mrs.Braund's sister and her mother were all in the basement when the bomb landed, and although Mr.Braund and the baby Valery were killed, all the others were alive and trapped under a great deal of wreckage. To add to the problems Mrs.Braund, who was trapped by the legs, was also in an advanced state of pregnancy. When the call for assistance was received at the Bristol Maternity Hospital, Assistant Matron Stevens and Sister Frampton immediately volunteered to attend the incident even though the raid was at its height with bombs falling all around the area. Although conditions were so bad that it was practically impossible to continue with the rescue operation Assistant Matron Stevens insisted on being lowered through a narrow opening, and by lying flat was able to reach one of the victims. Although her difficulties were further compounded by the fact that the only light available was that given by a torch, with the assistance of Sister Frampton and the Rescue Party, the old lady and two children were released and passed through a grating to safety. As the pregnant Mrs.Braund was found to be completely buried under debris, Sister Frampton went back to the hospital to obtain morphia and when she returned, Assistant Matron Stevens was again lowered into the cellar in order to give the patient an injection. By that time conditions were so dangerous that rescue work overhead had to be suspended as there was the grave risk of the whole building collapsing owing to blast and the shaking of the debris. Despite this, and in an atmosphere made poisonous by the escaping gas, the two courageous ladies went down again to their patient, and by three o'clock in the morning had managed to release her head. They were then able to make her more comfortable, sustaining her with sips of warm tea, and although still pinned down by the legs she managed to stay cheerful throughout her ordeal. All through the night they remained with her while the Rescue Party worked to clear a way out, but at about eight o'clock in the morning it was thought necessary to call in a doctor who immediately went down into the cellar to join Stevens and Frampton. All three then did what they could for the patient in the very awkward and dangerous circumstances until they were finally released in the early afternoon, when Mrs.Braund was taken to hospital, where both mother and child were subsequently reported "to be doing well". For their outstanding bravery and devotion to duty on May 30th 1941, Assistant Matron Elsie Lilian Stevens, and Sister Violet Eva Alice Frampton, of Bristol Maternity Hospital, were each awarded the George Medal. During the course of the raid Bristol's heavy guns fired a total of 2370 rounds, but as the weather was very poor only nine fighters were able to operate, Nevertheless, a Beaufighter from No.604 Squadron did succeed in damaging an He 111 over Dorset, the raider subsequently crash-landing at an airfield near the French coast, while two of the city's 'Starfish' sites were ignited, Downside collecting 74 high explosives and about 1500 incendiaries. The local bomb disposal company also had a busy time and of the 102 suspect devices reported, 51 were confirmed, including five delayed action weapons. By contrast, only five balloons in the Bristol barrage were either brought down or set adrift, and an operator injured by an explosive incendiary. Poor visibility over the target caused the attack to drift into the 'working class' suburbs of east Bristol, and as a result this was the city's worst raid with regard to loss of life, some 257 people being killed. However, others doubtless died as a result of the premature 'All Clear' which was sounded at 01.40 hrs, and although a second 'Alert' was signaled some eleven minutes later people had already started to come out of their shelters, only to be greeted by falling bombs. As no official explanation was ever forthcoming, soon after rumours started to circulate that either the anti-aircraft gun sites had run out of ammunition, a cease fire had been ordered or that the guns had stopped firing to allow locally based fighters to operate over the area. Although poor weather again severely restricted German operations in the latter part of March, attacks were made on Hull, London and Plymouth, and a small raid was carried out on Bristol on the night of the 29th, when a slight improvement in conditions over some bomber bases in North West France late in the day had allowed a sharp raid to be carried out against local harbour installations by III/KG 1, II/KG 76, III/KG 26 and KGr 100. The targets were South-East Bristol, with the concentration point between the east end of the Floating Harbour and the two Gasholders situated 2 kilometres east-north-eastwards, and Avonmouth where the harbour and industrial installations were the objectives. To guide the pathfinders both 'X' and 'Y-Beams' were aligned on Avonmouth, and III/KG 26 later reported that the Y-Verfahren signals were well received. 36 aircraft subsequently claimed to have dropped a total 33 tonnes of H.E. 's and 13,088 I.B. 's on Bristol and Avonmouth between 21.05 and 22.08 hrs. At Bristol only five crews bombed visually, the other 15 using Dead Reckoning and Knickebein because of the cloud and mist over the target. At Avonmouth fires were reported in the target area and these helped to guide following crews who also had some difficulty in locating the objective. No German aircraft were lost and no incidents were reported in Bristol, but at Avonmouth a number of fires were started in the dock area, and three tanks belonging to the Anglo-American Oil Company burned furiously, the last not being extinguished until 16.30 hrs the following day. Casualty figures that night were low, with 6 people being killed and 17 injured although the oil fire at Avonmouth required personnel from some 20 fire brigades in Gloucestershire, Somerset and Wiltshire, a number of them with foam tenders, to be drafted in to assist. The reinforced bomber force in the West was not, however, to maintain its new found strength for very long, the Luftwaffe High Command having issued orders on March 26th transferring of some 600 combat aircraft from France, Germany and the Mediterranean, to bases in Bulgaria and Rumania, to fly operations in support of the imminent invasion of Greece and Yugoslavia due to start on April 6th. In the meantime the weather had improved and normal Luftwaffe operations finally re-started after nightfall on April 3rd, when taking advantage of the generally improved weather conditions, an attempt was made against the harbour and industrial installations at Avonmouth by some 76 aircraft of Luftflotte 3 drawn from III/KG 26, II and III/KG 1, II/KG 76, KGr 100, II/KG 27, I and II/KG 54 and KGr 806. Once again to guide the pathfinders, both 'X' and 'Y-Beams' were aligned over Avonmouth, and it was subsequently claimed that a total 79.8 tonnes of H.E. 's and 8938 I.B. 's were dropped over Bristol and Avonmouth, during the attack which lasted from 21.16 to 00.45 hrs. At the beginning of the operation there was 7/10th's cloud cover which cleared to 2/10th's with a half moon between 22.00 and 23.00 hrs. Thereafter conditions deteriorated to 10/10th's cloud with rain by midnight. As a result only 49 aircraft actually reported over Avonmouth some crews bombing visually, but the majority using Dead Reckoning and Knickebein. The remaining 27 aircraft attacked, as an alternative, the Floating Harbour and industrial area of Bristol where the bombing was entirely by Dead Reckoning and radio methods due to the total cloud cover they encountered. German loses were again minimal, with the loss of just one aircraft and its 4 man crew. During this raid the fire fighting services were so prompt and effective that although thousands of I.B's were dropped, particularly in the section of Bristol from St.Michael's Hill to Redland Green, only 37 minor fires were recorded, all being extinguished by 00.48 hrs, the 48 Fire Brigades sent in from outside having been of great value in controlling the situation. A little later, when the H.E. attack developed, it was on a line between the Horseshoe Bend and Filton, while in Avonmouth only a few scattered incidents were reported. That night in Bristol a total of 22 people lost their lives with a further 56 being injured. During the night, Fighter Command flew 73 sorties, during one of which a Beaufighter from No.604 Squadron based at Middle Wallop, in Hampshire, and flown by the legendary Flight Lieutenant John 'Cats Eyes' Cunningham, shot a Ju 88 down into the sea off the Isle of Wight, while on the ground the Downside 'Starfish' site drew 25 high explosive bombs. Bristol's heavy guns were also in action firing 3327 rounds, although five small bombs fell across the Gordano site where a hut was hit killing one man and injuring five others, as well as destroying a height finder and damaging two guns and some ancillary equipment. Furthermore, the balloon barrage at Filton and that at Bristol lost a balloon each punctured by anti-aircraft shell splinters. The attack sequence continued, and the following night 85 aircraft drawn from I, II and III/KG 77, III/KG 26, II/KG 27, KGr 100, I and II/KG 54 and KGr 806 again targeted the harbour and industrial installations at Avonmouth, two raiding Bristol as an alternative. The operation against Avonmouth by the remaining 83 aircraft took place between 21.15 and 01.30 hrs with 80.4 tonnes of H.E. 's and 19,675 I.B.'s. Just as on the previous night the pathfinder force of KGr 100 and III/KG 26 successfully operated with X and Y-Verfahren, although III/KG 26 were unlucky enough to have an aircraft shot down at Hewish, near Weston super Mare, another victim of a Beaufighter of 604 Squadron from Middle Wallop. This was the only aircraft to be lost that night and it resulted in the death of 2 of the crewmen, with the other 3 being taken prisoner. During the attack the anti-aircraft defences expended even more shells than on the previous night with a total of 6450 rounds being fired by Bristol's guns, but the cost was high, some three gunners losing their lives. One man was killed and seven injured at Purdown when a gun fired prematurely, while a bomb landed on the Brickfields gun site where two men were killed. The 'Starfish' decoys were also in operation and Downside drew ten high explosive bombs, while the balloon barrage escaped lightly with only one envelope being punctured by shrapnel and some huts damaged at Avonmouth. Initially, it was a fine clear night with a half moon, although visibility did deteriorate slightly during the latter part of the operation. Not surprisingly the crews subsequently reported that the target area was visible for much of the attack, and at times was very clearly seen in the moonlight. As a result bombing was predominantly visual and only a small proportion of crews found it necessary to use Dead Reckoning or Knickebein. At the start of the operation the whole of Bristol was lit up by a large number of chandelier flares, 15 of which were counted in the air at one time, while H.E. 's and I.B. 's followed at regular intervals. However, the promptitude of the fire fighting parties and others once again helped to save the city from serious damage. Avonmouth was principally affected, and to a lesser extent the Westbury and Whitchurch areas, but minimal damage was caused at Avonmouth Docks, many of the I.B. 's which fell in the vicinity burning out harmlessly on high ground in Shirehampton Park. The most serious incident that night occurred at the National Smelting Company, where production was seriously affected, particularly in the Fertilizer and Acid Works. Considering the scope of the raid and the number of H.E. 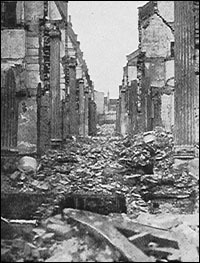 's dropped, casualties were small, with 3 dead and 21 injured, while the promptitude of the Fire Fighting Parties and the actions of the local firemen, and those from the 24 reinforcing brigades, once again largely contributed to the immunity of the city from significant damage, with only one serious and 21 minor fires being started, all of which were well under control by 02.00 hrs. Glasgow and Liverpool were the main targets on the night of April 7th, but a diversionary raid by 22 aircraft from KGr 100, I and II/KG 54, KGr 806, I, II and III/KG 55 was also carried out against the harbour installations at Bristol, nine of which subsequently attacked Avonmouth as an alternative. In addition a further 11 aircraft from KGr 100, II and III/KG 1, I and III/KG 27 unable to locate their main targets also raided Bristol where nine people were injured, the most serious damage being reported in Horfield. A total of 29.2 tonnes of H.E's and some 6442 I.B. 's were reported dropped on Bristol and Avonmouth in this attack which lasted from 21.13 to 01.17 hrs. As it was overcast in the target area, with 10/10th's cloud at 1000 metres, the operation was carried out using only Knickebein and Dead Reckoning methods, and no German aircraft were lost during the operation. On the next three nights German aircraft bombed Coventry, Birmingham and Tyneside, before the last major effort was made against Bristol. Known locally as the Good Friday Raid, this operation was carried out on the night of April 11th by 15 aircraft from Luftflotte 2 and 138 from Luftflotte 3 which reported dropping 193 tonnes of H.E. 's and 36,888 I.B. 's between 22.10 and 03.15 hrs. The designated targets were the harbour and industrial installations in South West and West Central Bristol over which Y-Beams were aligned, as well as Avonmouth and Portishead Docks, which was covered by 'X-Beams'. Participating units from Luftflotte 3 were I, II and III/KG 27, KGr 100, II and III/KG 1, III/KG 26, I and II/KG 54, KGr 806, Stab, I, II and III/KG 55, while from Luftflotte 2 came I and II/KG 53. In the target area the weather was generally fine with a full moon and a high layer of fleecy cloud. As a result, over Bristol, the bombing was carried out mainly with visual reference, however, from time to time thick cloud required the use of Dead Reckoning or other radio assisted methods. At 02.10 hrs the crews of I/KG 55 noted a large explosion followed by a flame rising 1500 metres into the sky, announcing the destruction of a gasometer at Canon's Marsh, the third to be lost at Bristol during the 'Blitz' The aircraft attacking Avonmouth also reported bombing visually, while at Portishead a considerable amount of smoke was encountered. The German attrition rate on night operations was now mounting and 5 bombers were lost, 3 which failed to return, including yet another shot down by the now Squadron Leader John Cunningham of 604 Squadron, and a further 2 which crashed in France. These losses resulted in the death of 17 crewmen, while a further 2 were injured. In Bristol it was seen as a two phase attack, the first phase beginning shortly after 22.00 hrs when the majority of the incidents straddled a north and south line from Bristol Bridge to Horfield, during which period a large numbers of fires were started, although most were speedily extinguished. The second phase commenced at 00.06 hrs and lasted until 03.52 hrs, during which entirely different districts of the city were affected, high explosives being scattered over the southern part of the City and St.Augustine's, Bedminster and Knowle, and to a lesser extent, Avonmouth and Fishponds. Casualties were heavy, 180 killed and 382 injured, the Civil Defence Services suffering badly with 14 Fire Guards, 12 Fire Watchers, 4 ARP Wardens and 2 members of the Casualty Service all loosing their lives. Considerably more damage occurred in the second phase, the AFS Station in Jacob's Wells Road received a direct hit, and several large fires broke out, the Fire Liaison Officer subsequently reporting 174 incidents, 28 small fires, 144 medium and 2 serious in the Bristol area. To assist the city reinforcements of fire and ARP services were moved in from surrounding areas, and during the night about 262 fire pumps were in use ensuring that all fires were under control by 07.00 hrs. The night, however, proved very costly for the Fire Services with two Messengers and eight Firemen killed, including four who were working at Wright's on Closton Avenue when a large high explosive landed nearby, blowing their bodies a considerable distance away. Canon J.S.Smith, an Ambulance Driver, later found three of them lying in the road opposite the public conveniences, all badly burned, and had the unpleasant job releasing them from the melted tarmac, in which the grisly marks remained for many years after. Although quite early on in the raid all the telephones in the Bedminster Division were put out of action, throughout the night the Civil Defence services continued to function without dislocation, due largely to the way in which Messengers and Dispatch Riders maintained contact between Warden's Post's and the Report Centre and with Control. As a result of these actions eight Messengers, Edwin G.Blinman Harris, Eric John Thrush, Edwin George Williams, Ronald Duggen, Raymond Charles Henry Martin, Ronald George Miller, Roy Lawrence Miller, and Maxwell Raffell, received King's Commendations for Brave Conduct in Civil Defence. In addition the Scouts amongst them were also awarded Boy Scout's Association Commendations, Harris, Thrush and Williams receiving Silver Crosses and Duggen and Martin, Gilt Crosses. The night saw the local anti-aircraft guns, including Weston's, fire 6765 rounds and the balloon barrage around Bristol and Filton suffer 14 balloons damaged by shrapnel. To combat the intruders Fighter Command flew 39 sorties which resulted in an He 111 being shot down over Dorset by a Defiant of No.307 Squadron from Colerne, a Hurricane of No.87 Squadron from Charmy Down destroying a Ju 88, and the Beaufighters of No.604 Squadron at Middle Wallop bringing down two He 111's and a Ju 88. The local 'Starfish' sites were also successful and drew a total of 34 high explosives, while in the city more than 100 suspect unexploded devices were reported, including more delayed action bombs than in any other raid, one of which tragically claimed the life a bomb disposal officer. Although it was not realised at the time, the main 'Blitz on Bristol' had now ended, as the Luftwaffe switched their attention to Belfast, London, Portsmouth, Plymouth, Sunderland and Liverpool, all of which were bombed before the end of April. The London attack of April 19/20th was in fact the heaviest ever carried out against Britain, some 712 aircraft dropping 1026 tonnes of high explosives and 153,096 incendiaries. Although during early May German bombers raided Bristol on a number of nights, it was only in relatively small numbers, these aircraft having selected the city as an alternative target, being unable to locate their main objectives on Merseyside and Clydeside. Throughout the month the Luftwaffe was preoccupied with the forthcoming invasion of Russia, but the basic plan still called for a continued assault on Britain's war economy, industrial capacity and importing docks, in order to camouflage the movement of German aircraft to the East. Raids were therefore mounted against Liverpool, Belfast, Barrow in Furness, Glasgow, Hull, Nottingham and Sheffield, culmination on the night of the 16th, by an attack on Birmingham by 111 aircraft. As part of this strategy the use of the minelaying units operating against England was reviewed, and by the end of the month instructions had been issued detailing their temporary deployment against selected land targets, where they were to assist the remaining bomber Gruppen by dropping Land Mines. Locally the most serious of these raids took place on the night of May 7th, when as a result of 10/10th's cloud cover over Liverpool some 16 aircraft from II and III/KG 27, KGr 100, I, II and III/KG 55 attacked Bristol, causing much damage in the Knowle, Bedminster, Clifton and City areas, killing 20 people and injuring a further 84. Among these casualties were four balloon operators from the Bristol barrage, all injured, one fatally, by a bomb which fell on their site. One of the Luftwaffe's final efforts was made on the night of May 30th when 34 aircraft again attacked Liverpool, while a further 15 (units not recorded) made for Bristol, where the crews claimed to have dropped 4 tonnes of H.E. 's and 12 Land Mines. As a result damage occurred in the Clifton, Westbury, Sea Mills and St.Anne's areas of Bristol where 12 people were killed and 29 injured, including a member of the AFS who lost his life when a bomb scored a direct hit on the Auxiliary Fire Station in Westbury Lane, Shirehampton. Although no Land Mines actually fell on the City that night, two came down at Kingston Seymour, including one which failed to explode. According to German records very few other Land Mines were ever aimed at Bristol, but on the night of June 11th a lone He 111 of I/KG 28, the unit normally employed in sea mining around the West Country's coastline, dropped two on the Bedminster area killing 16 and injuring 77, one of the fatalities being an operator from the city's balloon barrage. This aircraft unable to locate its assigned target in the Birmingham area, had again selected Bristol as a suitable alternative. With few German bombers left in France the raids on the West Country all but ceased, although KGr 100, employing X-Verfahren, continued to carry out small scale night attacks on local airfields and aircraft factories. The Bristol Aeroplane Company at Filton being their objective on the night of June 14th, while the Gloster Aircraft Company at Hucclecote was targeted on the 16th.